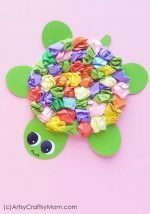 25 Gorgeous Paper Flower Crafts for Kids that are perfect for Summer- from tissue paper cherry blossoms, lilies, sunflowers to heliconias too! When was the last time you really looked at a flower? I’m not talking about a cursory glance or a sniff of its perfume; I’m talking about a good, detailed exploration of its beauty. Chances are that your answer starts with “Hmmm….” and ends with “….never”! We all know that flowers are beautiful, but we don’t realize exactly how stunning they are. So small and delicate, but they have some of Nature’s grandest phenomena hidden in them. But you wouldn’t know that unless you really looked like artist Georgia O’Keeffe did. And she tried to do justice to the pretty blooms she saw by painting their huge portraits. Of course, not all of us are as talented as Ms. O’Keeffe, and that’s okay! Instead, why not try out some flower crafts – from simple tissue paper blossoms to heliconias with their detailed arrangement. Yes, we’ve got all those and more in our list of beautiful flower crafts for kids! Let’s start with a very simple flower craft that you can make with paper cups. Even the little ones can try their hand at this simple craft that uses basic crafting techniques and supplies. Crafts by Amanda has a gorgeous tropical paper flower craft that uses a combination of plain and patterned paper. This is a project that’s a great way to learn special craft techniques like curling and beading, especially if your child is already familiar with the basic stuff. 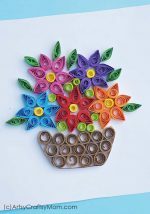 Making crafts out of plain craft paper or cardstock is pretty commonplace – why not try your hand at making some flowers out of corrugated paper? These quilled flowers have lots of lovely textures – both from the quilling and the special kind of paper used. Okay, these crepe paper daffodils are incredibly realistic; you’ll have to look twice to see that they’re made of crepe paper! Lia Griffith has detailed instructions with pictures on how to make these beautiful flowers, complete with leaves and a pot with pebbles! These flowers may look like they’re difficult to make, but the truth is that they’re super easy! All you need is felt and buttons – and you’re good to go! This is great for young kids who haven’t yet learnt to sew, since the project uses glue to stick the pieces together. If you’re tired of small flowers and would like something on a larger scale, go for these rainbow paper Dahlia flowers from Craftaholics Anonymous! Don’t let the size scare you – it’s actually easier than you think! A field full of flowers of different colors is a sight to behold, and is loved by everyone. Now what if you could combine all the colors into a single flower? Yes, it’s possible, with our tissue paper rainbow flower craft! Here is another super easy peasy craft from Easy Peasy and Fun! With craft paper and colored straws, you can create simple blooms with little to no effort. Great folding craft for preschoolers and primary school goers. Have you seen a Heliconia flower? This is a flower with an amazing alternate arrangement of petals, having a beautiful vertical structure. 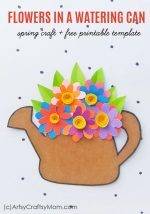 The resulting craft is so pretty, you’ll start looking for a vase to put them in! Can you believe that these gorgeous flowers are made from paper plates? Yes, plain white paper plates andwatercolorss are all you need to make these hand painted paper plate flowers. I could think of a number of uses for them – wall art, on gifts or greeting cards. Let kids learn about the anatomy of a flower with this handmade crepe paper flower craft! With details like stamens and crinkled petals, this is a craft that can occupy pride of place on top of a wrapped gift or a handmade card! Wondering what to craft with when you’ve run out of colored paper? Well, that’s the fun about crafting, there are no rules! Do what One Little Project has done and use cupcake liners to make some cute little flowers. If you’re a regular follower of this blog, you’ll know that we’re big on recycled crafts. This particular project recycles something found in every home – old newspapers! Use paints to turn plain old newspaper into gorgeous blooms! This paper sunflower craft from The Inspiration Edit is pretty straightforward. You print out the template and trace onto colored paper. Once you cut out the shapes, then it’s just a matter of assembling the pieces together! Felt is wonderful; you can make so many pretty things with it! But it’s a nuisance when you have to pull out that needle and thread when you’re feeling lazy! So the perfect solution is this no sew felt flower craft that needs just glue to come together. It seriously doesn’t get any easier than this cherry blossom craft from Pink Stripey Socks! As for supplies you need just tissue paper and glue. Yes, that’s it! Even the template is available for download, so even your toddlers can have a go at this craft! 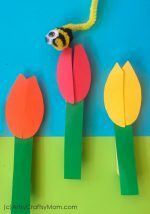 Origami is an awesome way to introduce young children to crafting with paper, and this Origami Tulip is a great beginner idea! It also helps kids to develop their concentration as they focus on each fold they need to make. Lily pads on a lake are a pretty sight, aren’t they? Even if there is a frog or two relaxing on them! Crafty Morning has an easy craft that uses some of our favorite crafting materials – cupcake liners and paper doilies! If you’ve been wondering what to do with your tired-looking paper doilies, here’s an idea – turn them into red roses! Yes, with some paint and a little glue, it’s amazing how trash turns into something so beautiful! Everyone plays tic tac toe, but why go for the same old boring board and coins when you can pretty things up? This clay version with little bees and flowers is so cute that you’ll want to play again and again and again! While these flowers are in the classic colors of the American flag, you don’t have to restrict making them for 4th of July or Memorial day! The colors stand out quite well next to each other giving you a rather stately looking flower! It’s probably hard to believe that these flowers are made with egg cartons, unless someone told you so, right? But that’s the beauty of turning trash into treasure – or in this case, into fresh new blooms! Here’s an easy peasy craft to keep the kids busy this summer – paper flowers! I personally think this is a good exercise to learn about color harmonies, and see different colored petals combine with each other. If you enjoyed the flower version of tic tac toe above and want something for the little ones too, try out this bee and flower game. The flowers here have ‘jaws’ and they’re out to catch the bee. Who will catch him first? When you’re done with making individual flowers of different colors, shapes and sizes, it’s time to go grand with a flower garden! 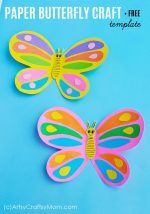 This paper quilled garden craft features not just flowers, but bees and butterflies too – the perfect spring decor for your wall! These flower crafts for kids feature some common flowers we see around us, but there are many, many more! However, these crafts should give kids ideas to think up their own crafts when they see a new flower, rather than going and plucking it. As famous poet Rabindranath Tagore said, “By plucking her petals, you do not gather the beauty of the flower.” Let’s make crafts instead!